Are you attending a School Farewell Party this year or a College farewell party? Have you spent countless sleepless nights wondering what to wear to the single biggest function of the year? Tired of scourging through your mom and grandmoms closet trying to find that one lucky piece that will be the one? Well, we all have gone through the massive migraine sessions trying to find that perfect outfit. To be honest, this blog post idea was not mine. I have said bye to school college like a decade back. Naturally, trying to write this post got me some jitters. But this is my honest try to help you figure out what to wear to a School Farewell Party. 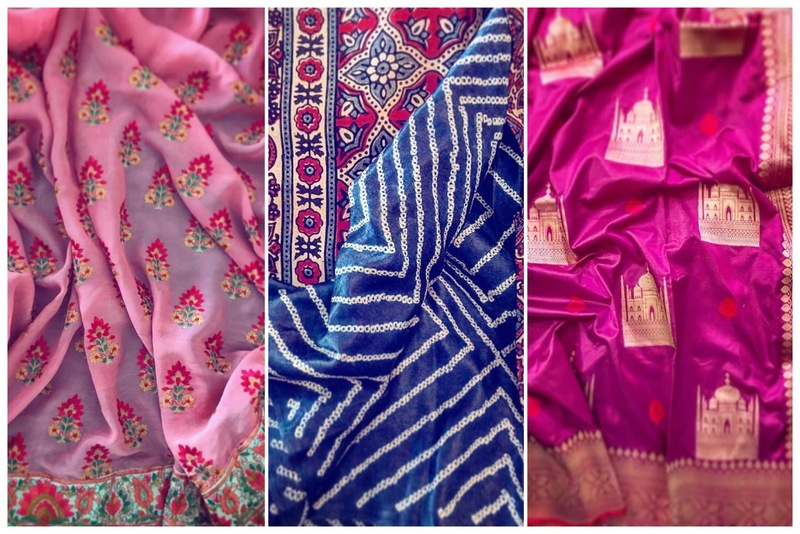 Check out the local fabric markets in your city. Take for example, if you are in Delhi – Go to Lajpat Nagar. If you are in Mumbai – check out Mangaldas Market. You will find a gazillion fabrics to choose from. Take inspiration from Pinterest on the colours that you wish to wear and just match the fabric shade. Go for minimalistic borders to add to the sareee. They cost hardly 50-100 bucks a metre and you need to really test your bargaining skills to score a good piece on budget. Ivories and gold are gorgeous colour choices for a summer School Farewell Party. They look elegant and all you need to do is team it up with a contrast pop blouse piece. You can find similar shades may be in your mums closet, and just buy an appropriate blouse piece and tailor stich it. Subtle is in these days but that doesn’t mean you can’t have fun. Ruffles is a great way of adding that glam to an otherwise simple saree. Choose pastels over pop and take a neutral colour with minimal embroidery work for maximum impact. Probably one of the safest easiest combos to work with. Choose a color that you love. Go with fabrics like chiffon or georgette which are easy to wear and maintain. All you have to do is choose a nice embroidery and a blouse to go with it. Contrasts look great too, and you will have a custom saree piece just for your School Farewell Party. How does that sound to you? If none of the options look good to you, just go with classics. A simple white gold saree with a contrast red blouse, or something similar. You can just never go wrong with these options. I personally love sheer sarees. Your body is going to be the beautiful best (read in shape) during school college years. If you have the permission, I’d say go for it. If you can score a nice sheer jacket from somewhere, then this look is the ultimate bombshell look to go for. It’s sweet yet has an edge to it. Even if you go for a bold blouse look, the sheer jacket gives it a nice peek a boo touch. If you have a masterji who can make this, then its easy to find the right fabric to give it to him. Try it if you can. # Long sleeves look hawt ! I have always been a fan of long sleeves. Even my farewell photos have blouses in long sleeves, and I’m happy to see the trend has remained constant over the years. Boat neck, long sleeves with small pallu drape, classics I tell you ! Just finished recording my first ever podcast interview with @withaliya for her podcast 'Confessions of Successful Asian Women' You guys know how much I love podcasts so I was humbled and honoured when Aliya asked me – especially when I checked out her other guests, and saw how amazing they all were! Aliya herself is impressive and I loved her questions – hope I did them justice. I'll share the link once its ready but in the meantime highly recommend checking out her other episodes! As much as pastels may be in trend, a traditional handloom pop colour saree can really look a stunner piece. Your mom will definitely have one of these stacked in her closets. So this ones pretty easy on the pocket. All you got to think about is accessorizing it well. Tell me what did you wear for your School Farewell Party?